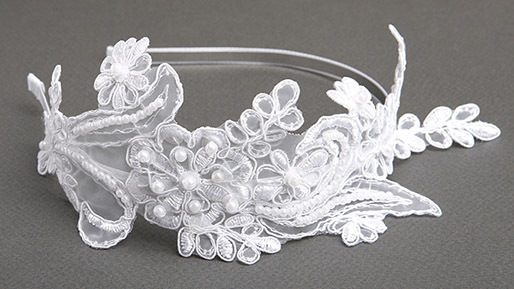 * This beautiful wholesale Vintage Lace headband on a delicate satin band is a graceful and elegant headpiece for weddings, proms or special occasions. * Mariell's vintage bridal headband has heirloom White lace 9 1/2" across & 3 1/2" w.
* The high quality antique lace is adorned with dainty pearls & sequins on a slender 1/8" satin covered headband. * Our wedding headband is stunning worn with a simple veil. * It is hand-crafted in the USA using the finest materials. * It is a beautiful wedding headpiece when paired with a Mariell veil such as our blusher style 3900V-W.
* It is also available in Ivory or Champagne Gold.